Collaboration inspires innovation and innovation is a must-have for any company that wants to become or remain a market leader. 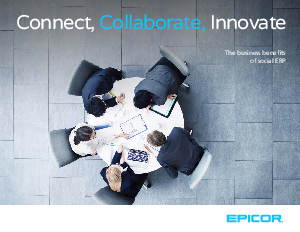 Download this eBook from Epicor to learn how Social ERP can support your business in creating a truly connected, collaborative environment that yields greater innovation, productivity, efficiency, and help grow business. The need to differentiate your business amidst today's increasing globalisation and tougher competition is more pressing than ever. Don't miss the opportunities social ERP provides to make your organisation shine— access your free eBook now.